Anterior Cervical Discectomy and Fusion (ACDF) is the most frequently performed procedure to treat neck pain, cervical radiculopathy, and myelopathy. The main purpose of this operation is to relieve pressure on the neural elements of the spinal cord and nerve roots. It is called anterior because the cervical spine is typically reached through a small incision in the front of the neck (anterior means front). During the surgery, the soft tissues of the neck are separated using minimally invasive techniques. The surgeon then performs complete or partial discectomy (removal of the disc between two vertebrae) and places bone graft between the adjacent vertebrae using an anterior approach. 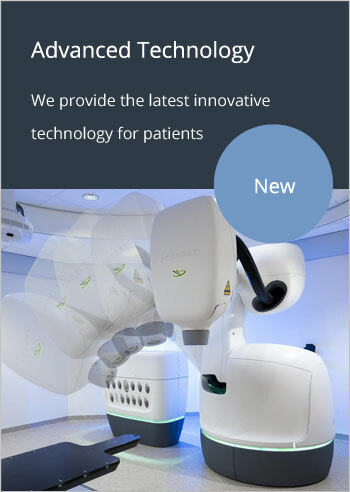 Normal disc space height is restored by implanting of bone graft. An allograft bone (donor bone from a cadaver) eliminates the need to harvest the patient’s own bone and acts as calcium scaffolding in which the patient’s own bone grows. There are no living cells in the bone graft, so there is a little chance of graft rejection. 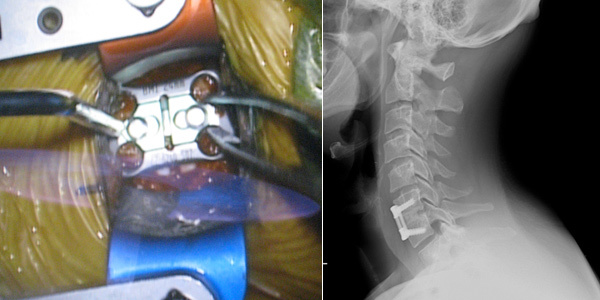 A small metal plate is fixed in front of the vertebrae to stabilize the spine and improve the chance of fusion. Figure. Anterior cervical plate (intraoperative image) and lateral x-rays. The patient usually can go home a few hours after surgery. With a continued effort to improve patient care and minimize morbidity, the physicians at Boulder Neurosurgical & Spine Associates published a landmark study on the safety of performing this procedure on an outpatient basis. All intraoperative and perioperative complications for 103 patients that underwent ACDF surgery were analyzed. The overall complication rate was only 3.8%. Based on these results we have concluded that it is in the patients’ best interest to let patients recover in the privacy of their own homes. Neurosurgeons at BNA not only make sure that patients have the best surgical experience possible, but also make it possible to receive such care at the most reasonable cost. Patients usually pay less co-insurance for the surgeries performed on an outpatient basis. The final decision to perform surgery on an outpatient basis is always based on a mutual agreement between the patient, surgeon, and anesthesiologist. Although reflex, sensory and motor deficits itself are not indications for surgery and may even persist despite surgery, surgical treatment is considered for patients with intractable pain, progressive motor weakness and reflex loss which corresponds with clear nerve impingement at the appropriate level on imaging studies. Patients with rapid neurologic deterioration should undergo earlier operative intervention, but an optimal timing for surgical treatment is still controversial. The physicians at Boulder Neurosurgical and Spine Associates performed a prospective clinical study, which analyzed if duration of symptoms had any effect on resolution of radicular symptoms in patients undergoing anterior cervical discectomy and fusion (ACDF) for cervical radiculopathy. The patients who had surgery within 6 months after becoming symptomatic reported significantly higher reduction in arm pain scores compared with patients who had waited longer. These findings should help to determine an optimal timing for surgical interventions if surgery is indicated, especially in cases of definite cervical nerve root compressions before irreversible nerve damage occurs. Excellent/good clinical outcomes of up to 95% have been reported in medical literature after ACDF. The patients that were operated at our clinic had even higher satisfaction with results and health-related quality of life scores than the average scores in the country according to the nationwide ACDF Clinical Outcome Registry. Physicians at Boulder Neurosurgical & Spine Associates prospectively evaluated clinical outcomes after ACDF. The main purpose of the study was to establish if alterations in cervical sagittal alignment correlated with a higher degree of improvement in clinical outcomes. The results of this study determined that patients who had the segmental sagittal alignment maintained or improved towards lordosis, had higher improvement in their clinical outcomes scores. Follow this link to read the results of this study published by BNA physicians.